While Labor Day was originally intended to celebrate, well, labor, now it’s come to represent a last gasp of summer vacation, so you don’t want to work too hard. Here are fast and easy recipes that will leave plenty of time for lounging and soaking up as much end-of-summer sun as possible. Chef Rich Landau shares his best tips for grilling vegetables. Summer: Burgers. Steaks. Hot dogs. Stop. As great as those staples of summer grilling are, it’s the very best time of the year to eat your vegetables. And so many of them are even better for spending a little time cooking over fire. 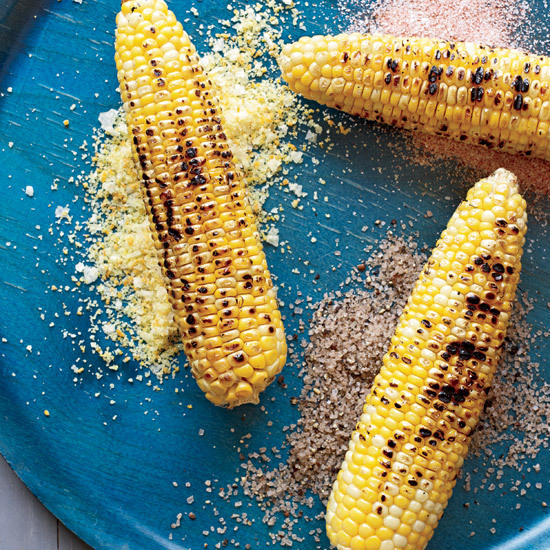 Here are Landau’s excellent tips for prime-time summer produce—like his very favorite way to grill corn—as well as other vegetables that you can find all year long. Now go fall in love with smoky carrot dogs, and happy summer. 1. Corn. It’s the classic, and so easy. Try putting it on the grill still in its husk. The kernels steam inside the husk so they come out juicy and smoky; plus, the heat will melt the silk so the ears are easy to shuck. Lose the butter and go for a nice, bright chimichurri (the bright green South American herb sauce), or olive oil, flaky salt and chile flakes. 2. Cauliflower. My favorite trendy vegetable is so good on the grill but it has to be pre-roasted or blanched for a few minutes first. Cut the cauliflower head into planks right down from the top to make “steaks,” then char them. Give them a drizzle of olive oil and lemon when they come off the grill. 3. Sweet Potatoes. This is classic Chinese street food. Wrap the potatoes in foil and put them right on the grill for 20 minutes. Then unwrap and char up that skin until it’s almost black. The flavor of the flesh is sweet and smoky—it needs nothing else. 4. Summer Squash. Simple grilled zucchini is a thing of beauty, but try making “ash” with it. Wrap whole zucchini in foil, throw in a garlic clove and some cumin seeds, heat up your grill until blazing hot. Then kill the heat and put the foil-wrapped zucchini right on the coals and let them sit for about 25 to 30 minutes. Unwrap, sprinkle with salt and pepper; the result is a creamy, rich flavor that you’ve never tasted before. This method works well with leeks, too, although they take longer to cook. 5. Carrots. Let’s make carrot dogs for a change. Pre-roast carrots in the oven for 10 minutes, sprinkled with Cajun spices and olive oil. Then char-grill the carrots and eat them just like hot dogs (buns optional). For a great extra effect, throw some wood chips on your coals to get that great smoky flavor into the carrots. 6. Fennel. Fennel is such an underrated grilling vegetable. Char it up with olive oil, salt and pepper. Let it cool, then toss it with your best cut up tomatoes, basil, cucumbers, red onion, olives and grilled bread. You’ve got yourself a mind-blowing panzanella. 8. Brussels Sprouts. First, lightly boil your brussels sprouts. Then finish them on the grill so they have a deep, delicious char. If they’re big enough, they’ll go right on the grill; if they’re small, slide them onto a skewer. Serve those great grilled sprouts hot or cold with a mustard vinaigrette.